Be sure to check back here in the fall, as websites and links will continue to be posted on supports and activities that will assist you in celebrating the liturgical year as a family. Prayers and activities to be added. Be sure to check page here in the fall as we will post information on the sacraments of Reconciliation and First Communion programming within the school and parish. Our School’s Namesake; the Madonna. Devoted to the Mother of Christ, the ‘hand-maiden of the Lord’ we are reminded as students and staff, that we are to live out the gospel values as Mary did. 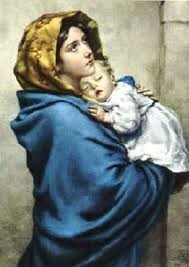 Ever faithful, Mary models that our prayers and devotions to her son are ever fruitful.